Gracie loves books and stories but had never had an audiobook until now. We were sent a copy of Emily Longmore's first audiobook Bizzy the butterfly and the creepy coordinating caterpillar. At first we were sent a copy to download but my computer is awfully old and couldn't cope with trying to copy it to a disc for me so Emily sent us an audiobook disc that made things a lot easier for us! 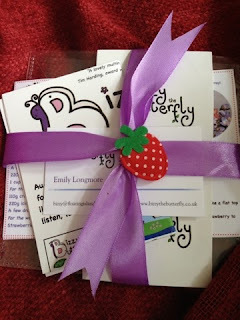 The disc came lovingly packed with some stickers, two Bizzy the butterfly inspired recipe cards, a leaflet about Bizzy the butterfly and the upcoming audiobooks and of course the audiobook itself and it was all lovingly wrapped in pretty ribbon with a felt strawberry on top. I thought this was a lovely touch and it got Gracie very excited. Bizzy the butterfly stories are aimed at babies and toddlers. The audiobook has music throughout in the background whilst the story is narrated. What I like is that it isn't just a story. There is the soft background music, little songs that your child can pick up easily and join in with and it is spoken as if the narrator is actually talking directly to your child. There are easy questions to help children feel like they are a part of it, one being 'have you ever seen a butterfly?' Gracie loves listening to it in the car and now knows when the questions are being asked and has her answers ready to 'talk to the lady'. I think it is really cute watching her feel so involved in a story rather than just listening to me all the time. 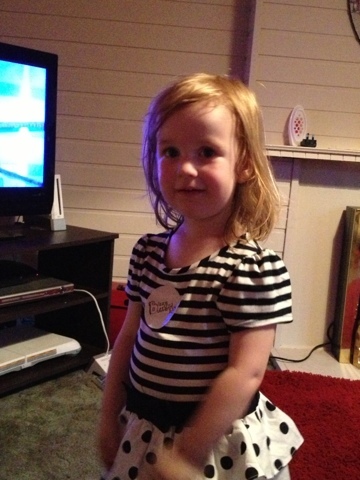 She has also learnt the words to the Bizzy the butterfly song and sings it everytime it is on. Another thing I like about the audiobook is the use of the music, it is so emotive and is used to create tension at the perfect times so your child knows something really exciting is about to happen. It is such a lovable story, Gracie has really fell in love with Bizzy the butterfly, she is always asking to listen to it and keeps telling everyone about her butterfly CD. 'Bizzy the butterfly and the creepy crawly co-operating caterpillar' is the first title in a series of different stories about the adventures of Bizzy the butterfly and friends. The audiobook is available to download for £1.50 which I think is a fantastic price! Also the second title 'Bizzy the butterfly and the over the log frog' is also available to download now. Although if like me you don't have a very trusty pc you can buy the CD version for £3 and it is definitely worth it. Not only is it great for your own children the CD would be a great gift for any friends with children. I will definitely be buying more when the new ones are available Gracie would love to find a new Bizzy CD in her stocking this christmas. Bizzy even has a fantastic website with a make and play section, with colouring pictures to print off and colour and other activities. There is a baking with Bizzy section showing you how to make yummy Bizzy the butterfly inspired cakes. There is even a Bizzy the butterfly shop where you can buy Bizzy the butterfly clothing. You can buy the CD or download the audiobooks as well as find out more information from http://www.bizzythebutterfly.co.uk/ or you can follow Bizzy on Twitter or Facebook for the latest news. We were sent the item free of charge for the purpose of this review. All views and opinions are my own.